Who doesn't love this book?! If you haven't read it yet - you must. It's a classic as most of Eric Carle's beautiful books are. I loved this as a kid. Also, because it is so famous , there are tons of resources for this out there... only problem - what to choose! 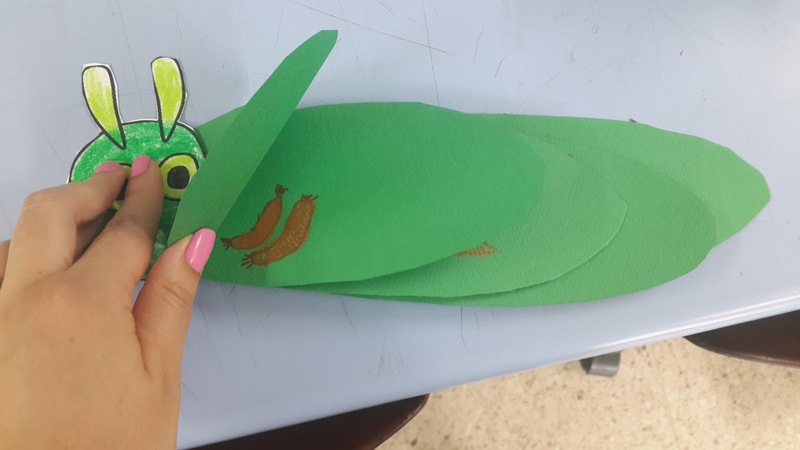 I actually found this camp day more challenging than the others prior to plan because there's just an overload of resources out there and it got hard to pick what would suit my ESL level kids and their ages. Download My Lesson Resources Free at my TeachersPayTeachers page. Now, this book is quite simple but I am doing it with both grade 3-4 and 5-6. (In separate classes). I have some activities only for grade 3-4 and vice versa. "Party in My Tummy" or "Cut The Carrot" as a warm up, cute fun songs. I play this often and it's always a hit. For lower level grades do it as a group of 3-4 or pairs. For the grade 5-6 individual or pairs is fine. You simply tell them to write down the alphabet on a paper or mini white board and then tell them they have 3 (or 5) minutes to write as many foods they can, aiming to get one food per alphabet letter. You can allow their textbooks or dictionaries (no phones) to do this also. Great jump start to the lesson and vocab. Food is perfect for this activity. Now, I made this into a vocab introduction as well as a little memory game to keep it fun. Then in the end, they have to draw the vocabulary as they are only given the words - so a draw memory game also. There's quite a few new foods for the younger ones but I don't think it's too much. Now, I have yet to get the translations for some of the key words such as 'through', 'ate' ,etc. But I included the slides for them in there. You can translate these if you'd like. I thought to help teachers more - I'd get this up here asap, so once I have the extra translations I'll update this post. I probably will play this only with grade 3-4 and I might do it later in the day, depending on time or how well they understood the vocab. It's just your simple hidden picture that they try to guess, it's revealed slowly by boxes disappearing via PPT animations. 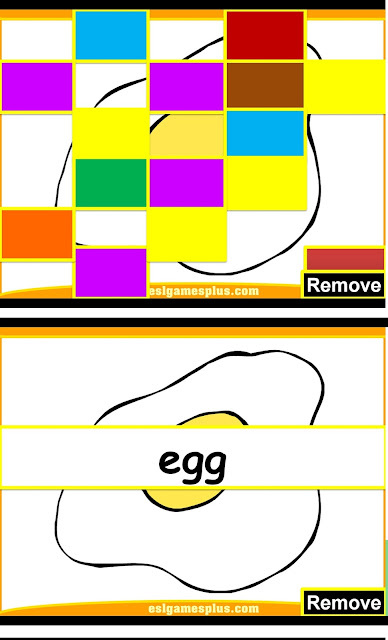 The template, I got free from ESL gamesplus , they already have one on food, so easy as pie. Activity 5: Read the Book! I know I didn't start with this as I did in the other lessons, but it's mainly because there is quite a lot of new vocab in this book that my students don't know. Tip: While reading get students to participate by asking them what day comes next (as it goes through the days of the week) and try to get them to guess the foods - telling them they are the foods we studied in the power point earlier. Now there are a bunch of free copies of the story in PPT online and offline to download instantly from the web. Perfect if you don't have the book or only have one copy, so it's easier to have a PPT of it, to project to an entire class. ppt download - simplified version of story, not original. But good pictures. Cute and animated PPT online, might be able to download, not sure. A free to download PPT of the story, cute pictures but not original pictures from book. There are a few online reading videos of this, if you don't have the book. But I suggest you get a copy for your school (camp budget) because it's a great book to have and you can use it again for food related lessons next year (Grade 5 'Help Yourself' lesson). 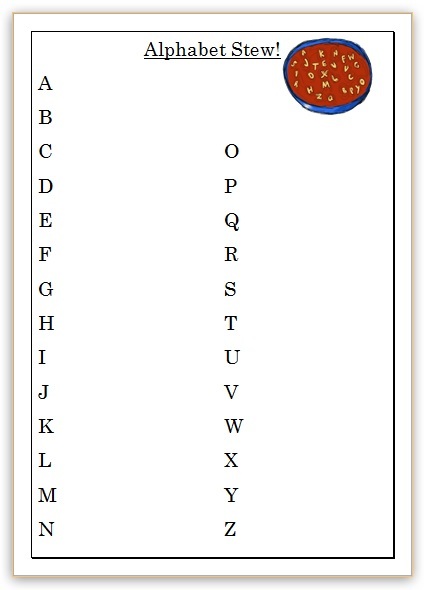 This is for grade 5 and 6 because I think the reading might be too hard for some of my 3rd grade as they are still learning alphabet and phonics where I am. 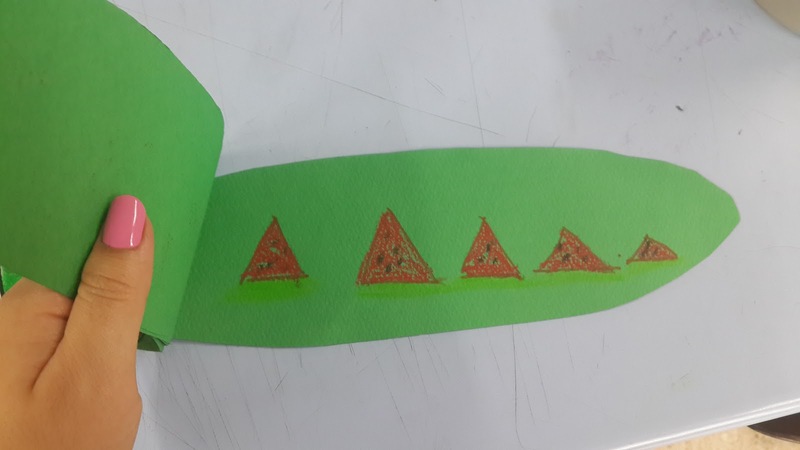 So I made this for grade 5-6 specifically. But if you are confident that 3-4 can do it, go for it! It's a template I found on Waygook a while back - whoever made it, thanks so much!!! It's so cool because when there's an O it has the BeeGees Staying alive song! hehe! love it. Very groovy. Anyway, if you haven't played before, it's a simple stand up and sit down game with reading involved. (perfect!). The students see a slide with words and they have to read the word -their choice - and then when the teacher clicks on the word (box) an 'X' or and 'O' is revealed. The X means they must sit down , they are eliminated from the game. And the 'O' let's them "stay alive" and stay standing. I've played this with tiny classes and big ones, and it's always a hit. We go round and round the class about 2 times usually, (class of 25) to see who is the last one standing, the winner I'll give a prize too. To make it more difficult, you can get them to read the word but also make a sentence with it. 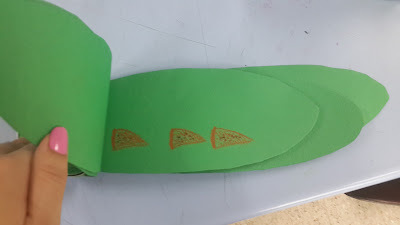 Activity 7: Work Sheet for Grade 3-4 I found on Twinkl. 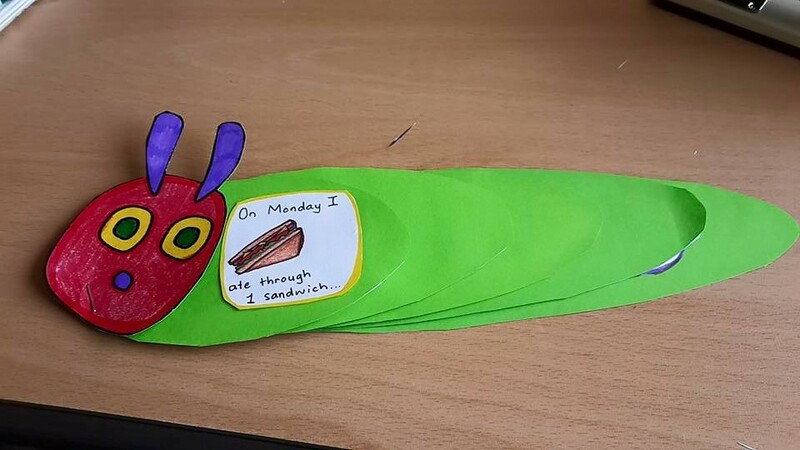 It's a color what the caterpillar ate, and what day of the week he ate it on. I love Twinkl, they had tons of worksheets and things made for this book. Twinkl was an excellent help for this plan. They have entire lesson plans and resources made for this book. You should check it out! Due to copyright, this won't be included in my download bundle. 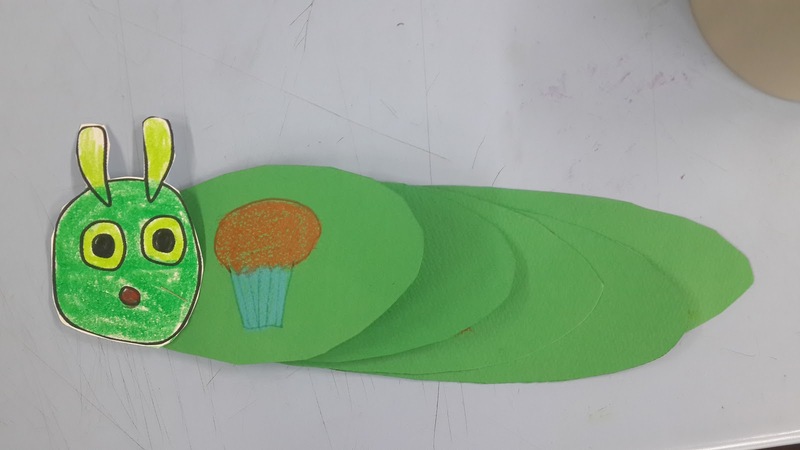 Activity 8: Make our own Hungry Caterpillar Books! In the shape of -Caterpillars! 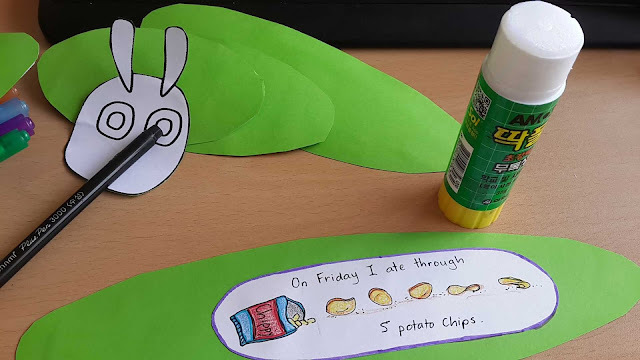 Of course, we need a crafty type activity, so I thought this was perfect. I found it on this Spanish teaching blog, which I can't understand, due to my lack of Spanish skills but his/her pictures showed me how it's done. I also made my own template so the kids can cut it out and color, more easy perhaps. I also made a step by step powerpoint to go with it. See the original blog post and details here. 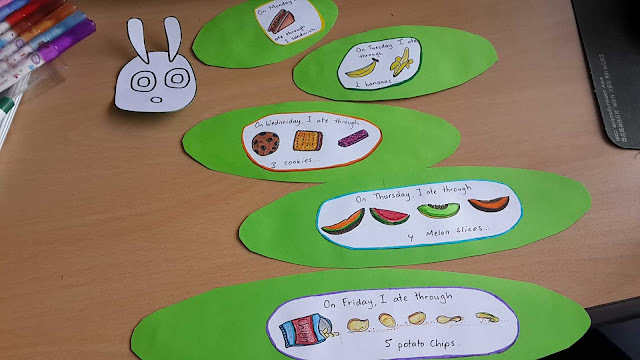 UPDATE (July 20th) : Now, here's mine that I made for demonstration because we're only going to make 5 days worth of food and we aren't copying the story - we will talk about our own chosen foods (they can make it up). First I printed and cut out the template I made in word (included in zip file download). 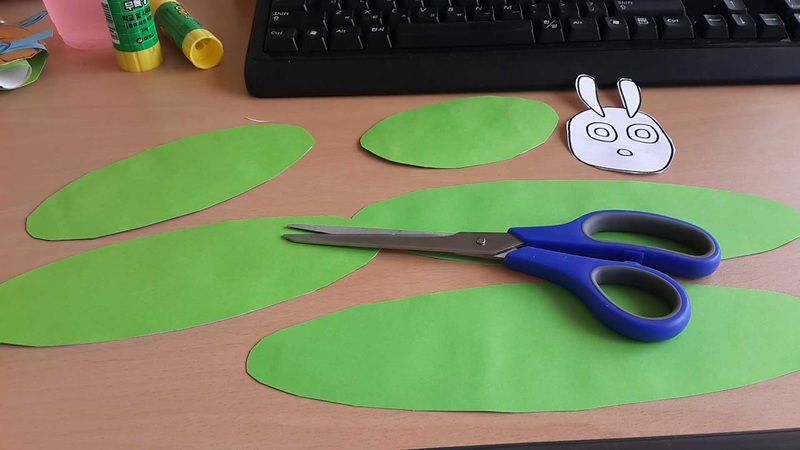 Then I stuck it onto green paper and cut again. (You could just print it all on green paper, but you'll need to erase the writing in the file. 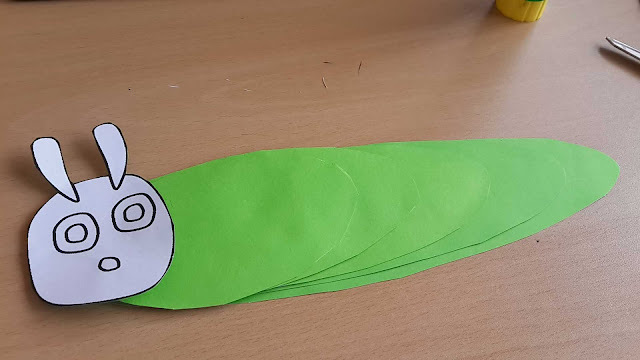 I like to cut and stick as this makes the paper thicker, plus the caterpillar face can be coloured in. 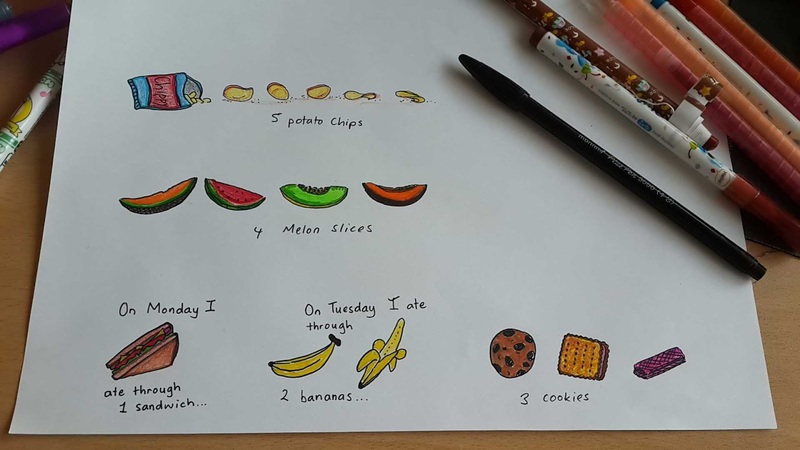 After, I drew my foods and wrote the sentences for each day of the week (up to Friday). You'll notice, like the book, I made the food go up in number, according to the day of the week. 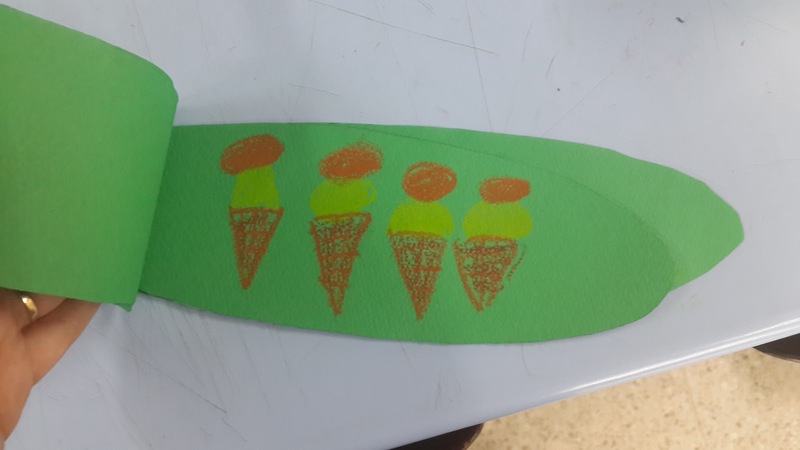 Next, I cut and pasted to the caterpillar. 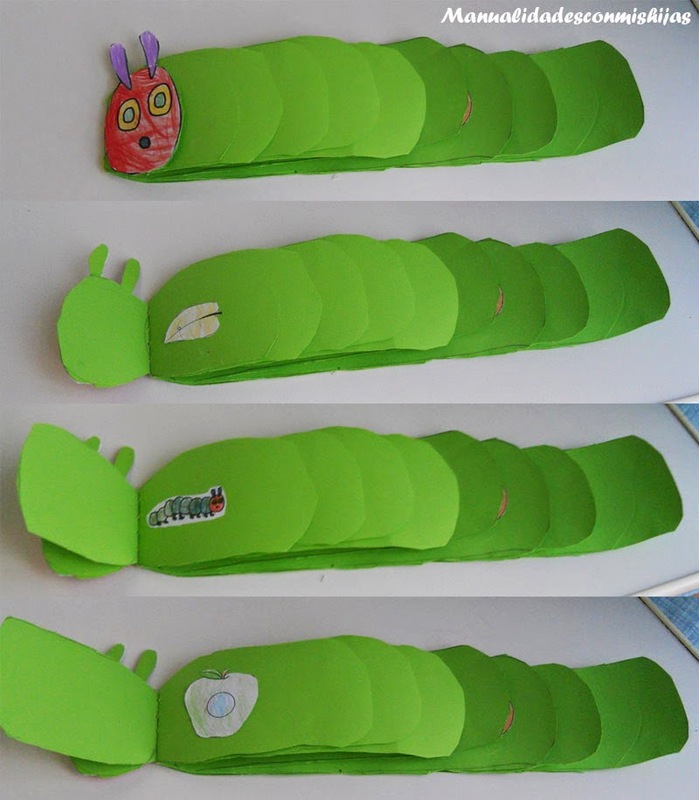 Then I stapled at the left edge all the green parts together and lastly, coloured and stapled the caterpillar face. We're just going to go up to Friday, and Friday will be the day we eat a lot like the caterpillar. Activity 9: Read and Share our books with the class. Presentations...etc. You can dress this up or down. Make it formal if you want, or just a nice class share. Make your own book too, will be a good example to students. Also - encourage their "Friday" foods to be more crazy and plentiful. When I make my demo, I'll put it on this post. 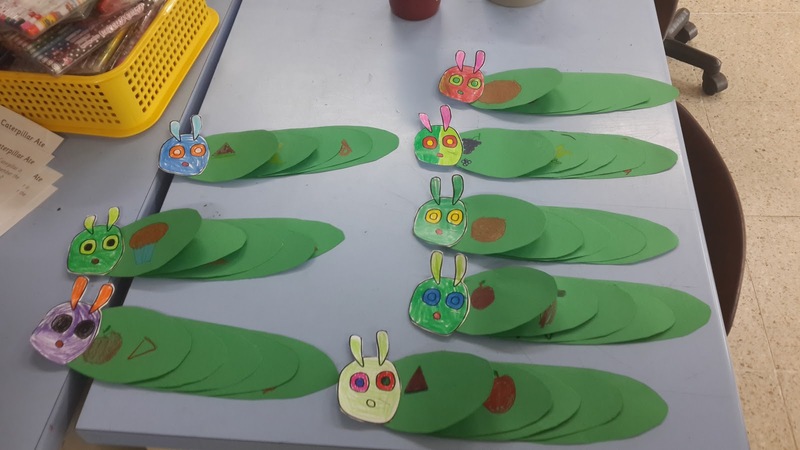 Activity 10: The Very Hungry Caterpillar Bomb Game - Agar.io online game theme. Have you seen or heard of this game? It's these big circles that float around and you eat the little circles and try not to get eaten, and you grow bigger, etc. It's what my students are currently addicted to at one of my small schools, they all play it on the PCs at lunch time. So I decided to make a bomb game with the same theme. All the questions are related to the book, so if you want, you could re-read the book just before it. The arrows indicate how many circles you can eat (points). Activity 11: If we have time, an online food game - you can play as a class , project it on a screen or TV as you do with normal PPTs. It's quite a cool game as it has the option to add teams and there's some cool graphics. It reviews some food and has a pirate/castle theme. I found it on ESLgamesplus.com. If I have time I have some more worksheets from TeachersPayTeachers that were FREE to download. Here's a cute one, to summarize the book. Just go to TeachersPayTeachers and search The Very Hungry Caterpillar and they have lots of freebies to download. Hope this can help someone out!